In recent news reports, there has been a drastic increase in the amount of racial crimes reported and addressed. People all over the world are being subjected to racism and are struggling with ways to cope with such actions. 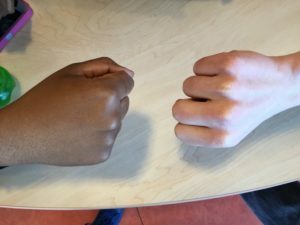 Students at Housatonic have also been looking for ways to help keep racism off of the campus as much as possible to keep the environment safe for all students and staff members. “I always feel safe here [at Housatonic]. I think a lot of that has to do with the great security staff the school is equipped with and the freedom we have. I think Housatonic definitely makes the campus feel safe and lets me go daily without worrying about facing racist situations,” Criminal Justice Club member Warren Jones said. According to the security office, there have been a minimal amount of cases involving racism reported to HCC, but the total number could not be disclosed. “I haven’t heard of any situations here but I definitely think that it could happen anywhere. I would love to see a group organized for those who feel or have felt threatened or treated unjust,” HCC freshman Alisa Berry said. One recent story that enraged the public and students and staff at HCC was the wrongdoings of the Oklahoma Fraternity SAE. They were under a tremendous amount of investigation due to the release of a nine second video containing a racist chant that went viral within minutes of its upload. Two members were clearly seen standing on a bus full of other students reciting the racist chant repeatedly. The fraternity chapter in Oklahoma was immediately discontinued after allegations were brought up and investigated. The two students seen clearly in the video were expelled from the school and their families released public statements of apology. “This is so crazy! People need to understand that there are major repercussions for your actions. [The] people here [on campus] are so nice. To imagine that someone could say those things openly is unfathomable. Seriously,” freshman Tahari Davis said. It is extremely important for students and people everywhere to keep in mind that there are major repercussions that come with their actions. Racism is not tolerated anywhere and HCC does not have a place for it on its campus. Have you or anyone you know had any experiences or faced racism directly or indirectly? If so, what happened? Comment below.